It won't be CA. And NJ fancies itself as CA. NY might except for NYC. Ma or CT maybe but it'll take more than 5 years. Won’t be MA. MAYBE CT. The states have to balance their budget each year, so as they spend more, they have to issue more bonds, which gets harder (they have to offer higher rates) the more sketchy the state's finances. The likely way Washington will deal with this is have the Federal Reserve buy those bonds, and just add them to its mythical balance sheet, which never seems to shrink. Then the states can keep spending like drunken sailors. The problem (it's a good thing actually) is the Fed probably doesn't want to bail out the states, cause it won't benefit the banks the way bailing out Wall St does. They'll get pressure from Washington, but I don't know if that'll be enough. California is the one to watch. They're short billions in their retirement funds, the schools, hospitals and social services are swamped with illegal immigrants and the state has a large number of congress critters to push a bailout through. If Kamala Harris ever wins the White House, game over. 3. 13% income tax (top rate), 9.3% income tax on those making $52k. Middle class is leaving, replaced by freeloaders. #1 wealth gap in US. #50 in quality of life. 4. State government is moving quickly to the left, if you didn't think that was possible. The only way I can see a state declaring bankruptcy is if it reverts to territory status and maybe gets broken up into smaller states. New York, California, and Illinois are largely bankrupt because of a few cities bleeding the rest of the state dry. If LA, NYC, Chicago, etc. all had to stand on their own feet as city-states without the ability to lord over the rest of the state & drain its coffers they'd act differently. This really goes back to the issue of apportionment at the state level. State senates used to balance rural vs. urban interests and keep budgets in check. That doesn't happen anymore. Oh, and Trump should give the environmentalists in CA what they want good and hard. CUT OFF THE DIVERSION OF THE RIVERS and return the watersheds of the entire southwest to their respective states. If CA wants potable water they will have to make their own in CA and not be stealing it from everyone else. BUMPA01603, Christian, falcon123 and 2 others like this. True, and what's the coup-de-grace that will knock them back into reality (towards the center politically)? If CA wants potable water they will have to make their own in CA and not be stealing it from everyone else.If CA wants potable water they will have to make their own in CA and not be stealing it from everyone else. Or buy it at market rate from another state. TX does not allow other states to steal their oil just because they need it. CA is extending the EBT logic of "You have it, I don't, I need it, therefore it's mine" to state natural resources. falcon123 and Fixxah like this. We're way beyond anyone figuring it out. The only way out of this is War Between the States II. Christian, Gak44, SKumar and 1 other person like this. Hey! why don't they (the Hollywood people) just start sending out checks now to those of us who don't make as much $$$ as they do??? I'm game! Brad Pitt, send me a text and I'll give you my mailing address for those checks to start coming! Cowgirlup and Bfatz like this. New York taxes have gone way past insane. This sounds like it's from The Onion, but NY has a sliced bagel tax of 8 cents a bagel. If the deli does not cut your bagel, you beat the tax. Come on up, the water's fine. I did it in 2014 and don't regret a thing. 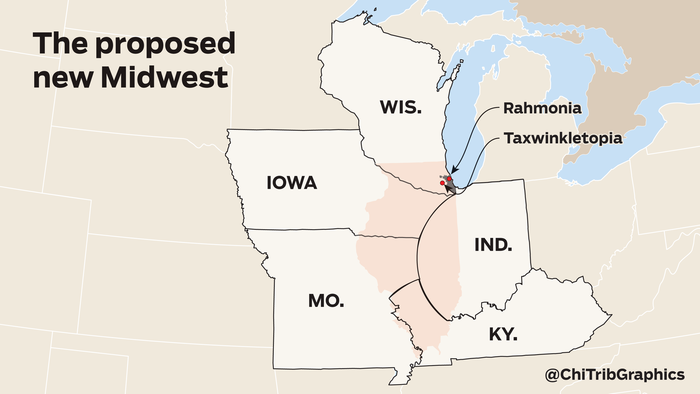 There was talk in the last few years of Illinois going bankrupt, split up, and parts absorbed by bordering states. Not sure any of them will ever get it. When they run out of money, they just take more from those who remain until there is nothing left. NY, CT, and NJ are spiraling into oblivion. Mass is benefiting from this descent (GE, Boston's ever increasing property values, etc.). Eventually Mass's economic bubble will burst. This extremely low level of unemployment will end at some point. Mass will then have two options: jack up taxes to pay for an increasingly expensive infrastructure, which is the typical response regardless of location or political affiliation in places with an aging population, or cut taxes to draw business and residents like Mass has historically done in 2002 and 2012. My bet is that Mass will cut taxes marginally to keep the gravy train rolling. Massachusetts residents will see their income taxes reduced in 2019. While it amounts to hundreds of millions of dollars collectively, it's probably not much to individuals. The state income tax rate will be reduced slightly to 5.05 percent. The cut could cost the state about $175 million statewide. I don't know enough about California's idiosyncratic economy to be able to make a statement about it. NY, CT, and NJ are spiraling into oblivion. Mass is benefiting from this descent (GE, Boston's ever increasing property values, etc.). Eventually Mass's economic bubble will burst. This extremely low level of unemployment will end at some point. Getting GE hasn’t been much of a benefit. Have you been paying attention to GE’s stock lately? Here in Boston, the biotech and software/internet companies are going to be driving high employment for the foreseeable future. Universities and hospitals kept Boston from becoming a Baltimore. Though it was getting close in the 1970s. A.I. might kill the tech employment golden goose. But that's a few years away. No, it won’t. It is an added development tool, one that is increasing employment, not decreasing employment. In addition to hiring software engineers, internet companies are now hiring data scientists. For example, the internet clothing retailer StitchFix has an 80 person data science team that runs their machine learning (AI) efforts. The US graduates about 50,000 computer science majors each year. We have about 500,000 job openings for software engineers. During the last big tech “recession”, the combination of dot-bomb and 9/11, I was laid off. I was given 2 weeks notice before my last day and 3 months of severance. One day before my last day at work, I accepted a new full-time position. So the net result was that I was paid double for 3 months. I get pinged by recruiters multiple times each week and I’m not looking for a new position nor am I a superstar. I will retire within the next 10 years. I’m confident that I will be fully employed during that time if I choose to be. I'm not sure how AI is going to kill tech employment. Can you elaborate? In the next 10-20 years, the people that need to be worried are truck drivers. There are around 3million truck drivers in the U.S and companies developing self driving trucks. I dont think the city delivery guys will be affected first, it will be the interstate guys. Most in this forum will be retired or dead before AI can truly start replacing jobs and making most people obsolete. I am very skeptical that self driving vehicles will become a reality anytime soon. calsdad, RHJJ, Zappa and 1 other person like this. AI will automate a lot of coding, IT, research, etc. as the tools highly paid people use become self aware and need far smaller numbers of people do to the same job. Think about how software is obliterating paralegals. Same will happen with other professionals. Actually, even the interstate trucks are safe for another 10-15 according to latest scuttlebutt. The whole self-driving car thing amounted to a lot less in a lot longer time than promised. Pete85, Broccoli Iglesias and M1911 like this. Heh, evildragon. It’s looking like the interstate trucks are further along than what’s being talked about. Right now the states are what’s limiting it. But there are 3 major players operating here in AZ. From what I have read (I'm not in the law field), looks like most of the work AI is doing is scanning documents and pulling information, a job that people still do or used to do. But when you think about it, it is a very basic task. As far as automating some code writing, maybe, but wouldn't that make the developer more efficient? I'm not sure how that would cause a developer to lose his/her job. The machine doesnt have the problem solving skills a developer needs to have. You still need someone to tell it what to do. There is not an infinite supply of work. So as efficiency moves up either demand must grow at the same rate as capacity (which is a function of efficiency) or you need less people to do the demanded work. It is almost never that the most skilled in their field get phased out with efficiency. Its the people who's cost outpaced their throughput that do. Yet most of those very wealthy that are leaving voted for the same liberal democrats that raised their taxes. Wherever they land, this virus will fund more liberal democrats who will raise taxes and the cost of living. In NC, they are doing this in Raleigh, Durham, Cary, Charlotte, etc. They are doing this in Texas to Houston, Dallas, Austin. Even "middle class" libtards fail to make the connection between the policies they vote for and the high cost of living that follows and drive them out. Just for kicks, let’s calculate how Trump’s plan affects NYers. Say you own a $2 million home (probably a small apartment) in NYC, and you make $300k. Under the old tax plan you could deduct the entire $108,000. Now you can deduct $10,000. So you’re gonna owe about 30 grand more on your Federal. Ouch. 3) Doesn't NYC have its own Income Tax? 4) Knowing nothing about NYC property taxes, that seems like a low number. So not disputing an OUCH just moving some numbers around on the profile.